I also want to say a big thanks to Matt Asay’s coverage of Severed Fifth on CNET. Thanks Matt! Big thanks also to Ryan Busch who is going out and about spreading the Severed Fifth word in Michigan. Keep up the great work Ryan! Go and grab the PDF of the page, and you can also grab a PDF Poster which I showed a few days back. [Denied by Reign] “is not afraid to pull punches” – is that what you really meant to say? I know, but “pulling punches” is deliberately not hitting as hard as you can. 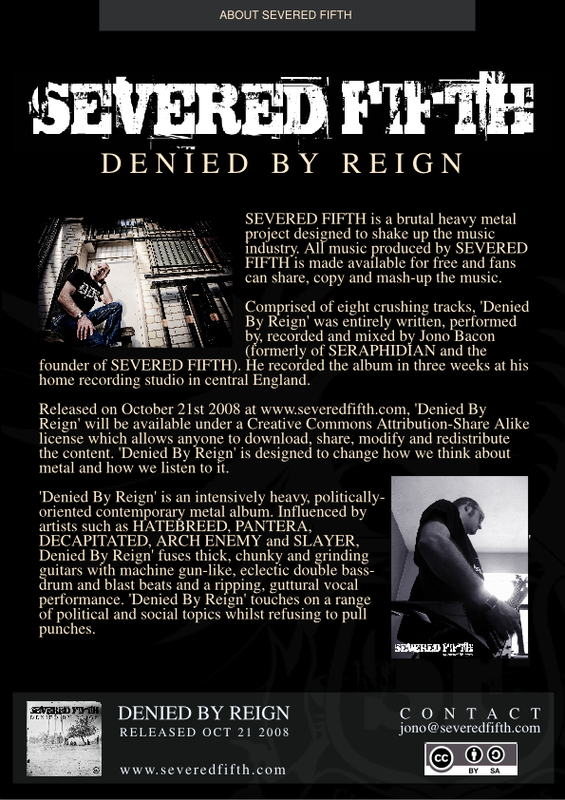 I’d have expected it to read something like “[Denied by Reign] doesn’t pull any punches”. I’ve iistened to the sample of track 5 thus far – like it, reminds me a lot of “…And Justice for All”. Jono, jmi is right. If the gist of that sentence is supposed to be “Denied by Reign is not afraid to be as hard hitting as possible” then it should say something like “Denied by Reign won’t pull any punches”. Otherwise, this is an awesomely cool project and I wish you the best of luck with it. You mean “formerly of Seraphidian”, not “formally”. jmi and Will’s points are also valid.